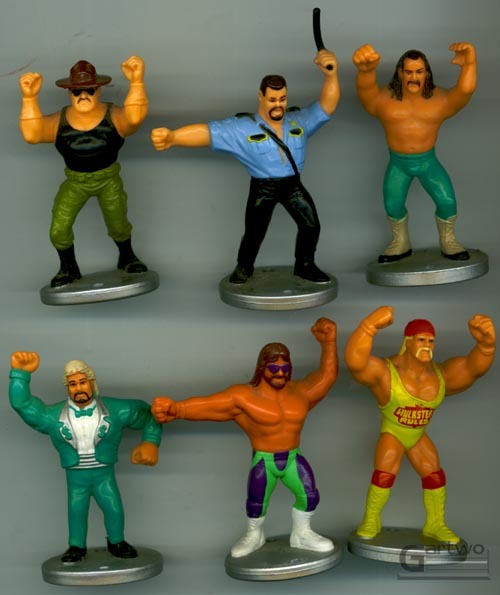 These figures were released as part of the Hasbro WWF line in 1991. 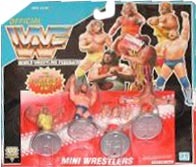 There were 3 different 4-packs, as well as a Royal Rumble playset, which included six more wrestlers. The 4-packs weren't very hard to find in stores at all. As a matter of fact, I bought several of them off the clearance rack of a local Hills Department Store in the mid 90's for $2 each! The ring, however was a different story. It was (and still is) very hard to come by. I always saw plenty of the 4-packs in stores, but I never recall seeing the ring. I don't know why the ratio of 4-packs to rings produced was so uneven. Huge thanks to Tim Moffitt for helping me complete this set! 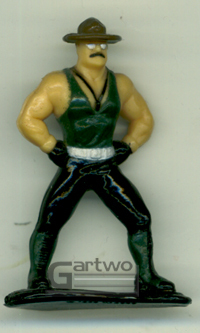 Not part of this line, but made by Hasbro, here's a tiny PVC figure of Sgt. Slaughter produced in 1989. as part of a premium offer for their GI Joe figures. Don't be fooled by the pic, it's a very small figure, standing only about 1 inch. Pics of the Royal Rumble ring coming...eventually!